Fact: Paratha is not a diet food. Our Indian-American Mash-Up Nishta Mehra‘s love of cooking is an inherited trait: Her mom, Veena, is famous for her parathas, a griddled flatbread served plain or stuffed with veggies, spices, and love. Veena’s parathas are the gold standard. We’re beyond lucky at Mash-Up HQ to get the recipe. Please note, you can and will find a million versions of these recipes elsewhere, but they won’t be Veena’s. For more on why, and how, Nishta learned how to make these pockets of love, read: Life, Death, And Parathas. Veena’s Parathas Be vigilant. Be like Veena. The basic dough for parathas, atta, is the same. Make it ahead of time, at least 1 hour before you plan to cook the parathas. You can leave it out on room temperature for up to 8 hours, provided you keep it from drying out. I prefer not to keep atta in the fridge, but if you’re going to, wrap it tightly with plastic wrap and then put it inside a sealed container. 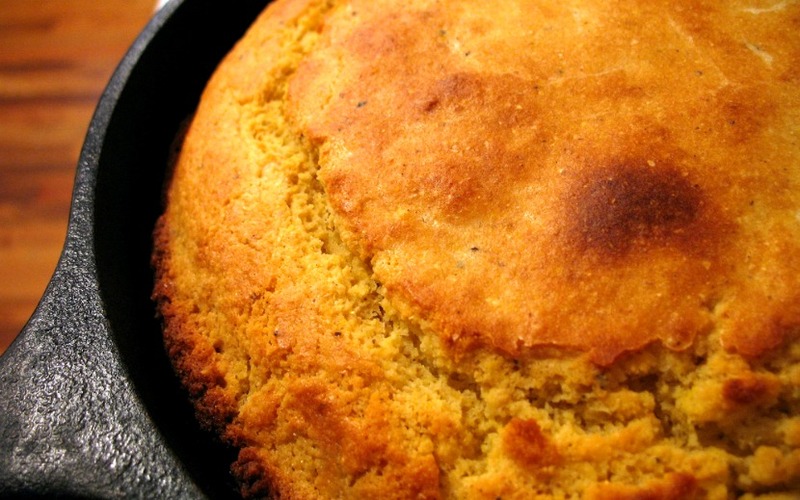 You may still need to tweak it when you take it out to work with it, either adding more flour or more water. The dough recipe provided here is enough to make one batch (10-12) of EITHER aloo or gobi parathas. If you want to make both, double the atta recipe. Combine ingredients in a medium-sized bowl, starting with 3/4 cup water, then knead by hand for 5-7 minutes until the dough is tacky but still holds its shape when poked with a finger. Eyeball the dough as you knead, and add water if you see any dry crumbs in the bowl. Cover the dough with a wet paper towel, then cover the bowl with a plate — leave on the counter in room temperature. In the meantime, make your filling. For aloo, or potato, parathas, Veena says you must use Idaho potatoes. No exceptions. Just do it. Wash the potatoes, then boil them in a large pot for 45 minutes to 1 hour, turning halfway through. You want the potatoes to crack open with no resistance when prodded — if you overcook them, they’ll be soggy, and if you undercook them, the mixture will be lumpy and your parathas will break. 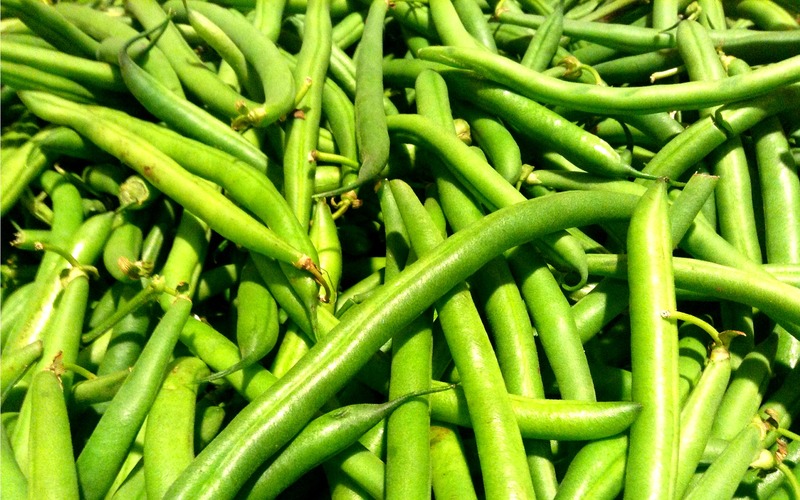 Remove them immediately from the water (“No excess water –be vigilant!”) and, wearing kitchen gloves, peel them while they’re still hot. 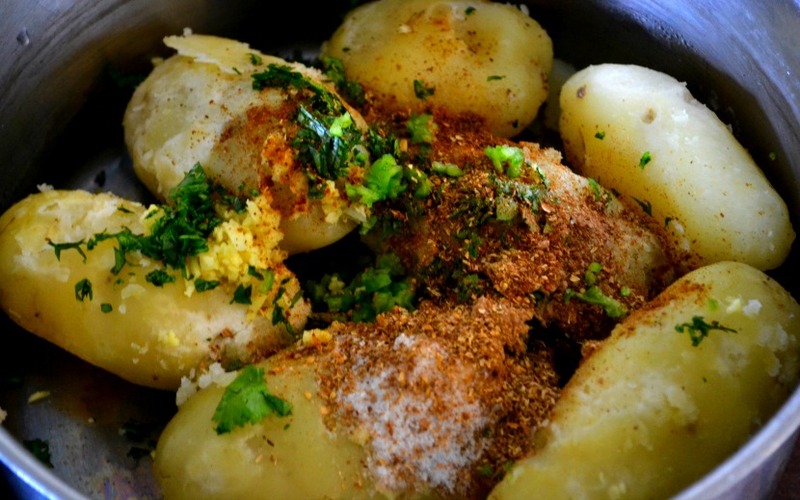 Using your hands, mash the potato until it is free from lumps and more like a paste. Mix in the other ingredients by hand. The mixture should hold together when you squeeze it in your hand. Because the gobi, or cauliflower, parathas are harder to roll out, you cannot fill them with as much mixture as you can the aloo. So I recommend reserving about ¼ of the cauliflower for another use. That use could be as a delicious snack while cooking. Grate the cauliflower. 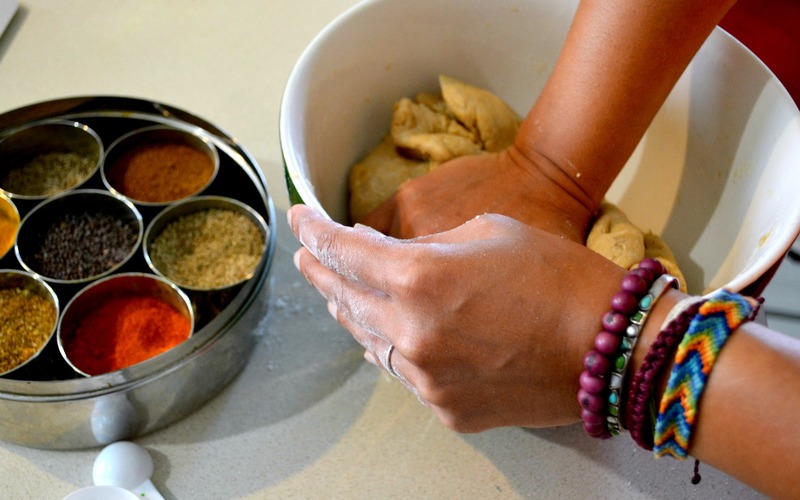 If you have a food processor, that’s easiest, or you could do it by hand (watch your knuckles!) using a box grater. You’re looking for a yield of 4-5 cups shredded cauliflower. Now, we employ my mom’s ingenious method for drawing as much water out of the cauliflower as possible. Place the shredded cauliflower in a bowl, add 1 tsp. salt, toss, and let the mixture sit for at least 20-30 minutes. Squeeze the water out of the cauliflower in batches, using a double layer of cheesecloth. Then add in the rest of the ingredients. Rolling out the parathas is terrifying to do for the first time. You will be certain that you’ll mess it up, and you might, but you can patch holes with extra dough and/or a dusting of flour. Don’t panic! As Veena says, “It’s still going to taste good.” Also, it will taste good because you should have extra ghee or butter on hand for this process. Here goes! For both kinds of parathas, use about ¼ cup dough. Dust your rolling surface with extra atta flour, then roll dough into a round that is approximately 6 inches in diameter. Dough should be thinner than pie crust but not transparent or so thin that it tears. 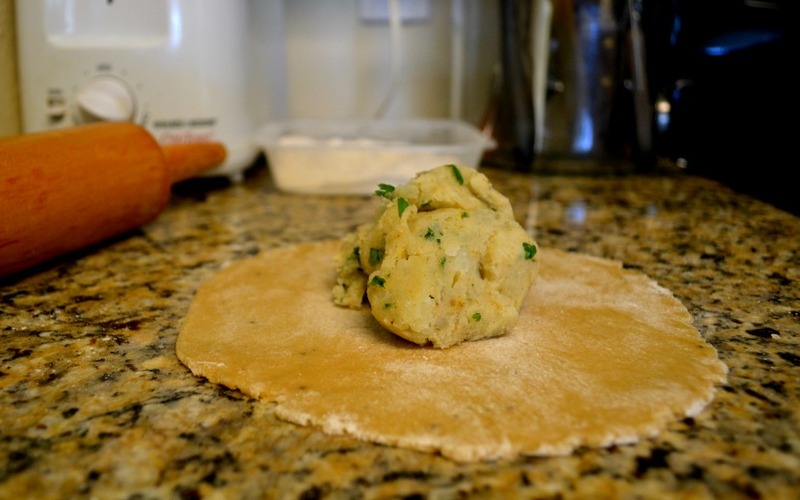 For aloo parathas, scoop ⅓ cup of the potato filling into the middle of the dough round; for gobi parathas, use ¼ cup. Leave the filling in a mound and bring the edges of the dough up to the center, covering the filling and creating a kind of overlapping spiral pattern. Press down gently, then turn the paratha over, seam side down, and roll it carefully back out to a 6-inch diameter. Once you’ve successfully assembled a paratha, you can either cook it to eat right away, or par-cook it to keep and serve later. In both cases, use a flat griddle, the kind of surface you would use for pancakes. To par-cook, add the assembled paratha straight to the pan (no oil, butter, or ghee) and cook briefly on both sides, using medium heat — you’re looking for a few spots of color on each side. 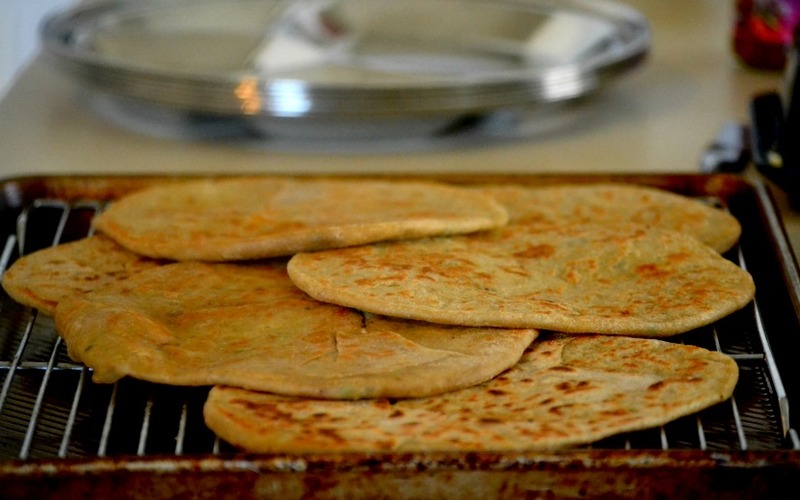 As you cook the parathas, excess atta flour may gather in the pan — wipe it out occasionally so the flour doesn’t burn. Once par-cooked and cooled, stack the parathas between squares of waxed paper, wrap in foil, and store in a Ziploc bag — in the fridge for up to a week, or in the freezer for up to a month. (Ziploc bags are the unicorn of bulk cooking assembly tools.) When you’re ready to serve the parathas, follow the steps below. To cook and serve immediately, heat the griddle over medium, then add the paratha straight to the pan. 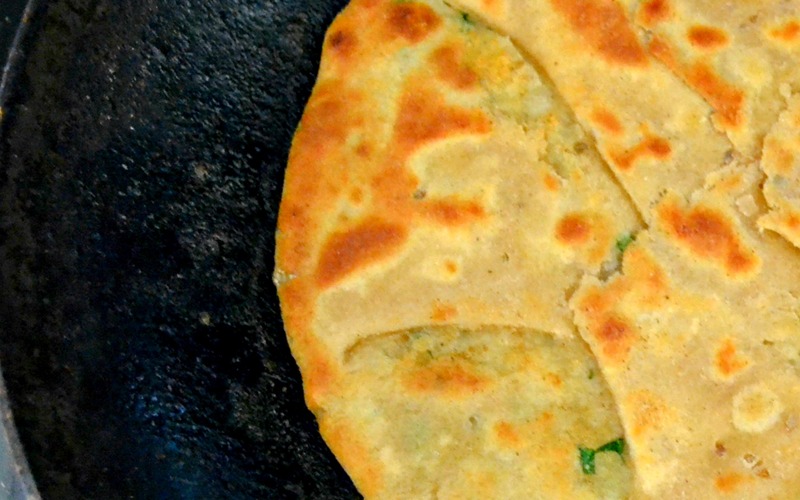 Once you see a few bubbles, flip the paratha, adding 1 teaspoon ghee or vegetable oil to the top. Cook on the other side until brown and crisp, then flip once more so it’s crisp and has dark-brown spots on both sides. Remove from the griddle. Spread butter on top before serving. Enjoy! Nishta J. Mehra was born and raised in Memphis, Tenn., the proud first-generation daughter of Indian immigrants, which means she can make both saag paneer and buttermilk biscuits from scratch. Author of The Pomegranate King, she is currently at work on her second collection of essays, Making Space: On Parenthood, Family, and (Not) Passing, forthcoming from Picador. She teaches high school English in Texas with her wife, Jill, and their son Shiv. Follow her @bluejeangourmet.